My suggestion if you simply MUST attend the men's final, for example, and you don't have tickets yet: wait until the last minute and jump on TicketExchange. Last year, when Nadal booked his place in the final for the first time, prices (even along the upper rim of Arthur Ashe Stadium) spiked to $300 and up. A few hours later, Djokovic upended Federer and, no disrespect to the Djoker, the market crashed. Prices on TicketExchange and after-market websites were slashed in the moments after the longed-for first Federer/Nadal final in New York was thwarted by the Serb. It's a risk for sure, but one that may well pay off. One note, buying a single ride subway fare will cost you $2.50, buying Metrocard though, will get you a roundtrip to the Open at $2.25 each way. 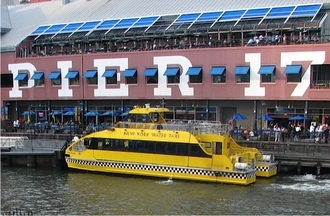 An interesting alternative, that frankly, I've yet to try, is the NY Water Taxi to the US Open. Note, the Water Taxi is only available GOING TO matches, it leaves from South Street Seaport 90 minutes before the start of a session and from the pier at East 35th Street 75 minutes before matches. Tickets must be reserved online, but as the Water Taxi is sponsored by Delta during the US Open, they're just $1. Plus, as a bonus, you get views of the New York skyline free with purchase. It's an attractive option worth considering if you're visiting New York and staying (or living) in the Financial District or Murray Hill. For Fans - I will assert and fiercely defend this point to anyone who'll listen. Day Session, Arthur Ashe, First Week, end of story. A day session ticket to the first week in Ashe is simply the best value in all of sports. Imagine if all of the NCAA March Madness tournament was unfolding in one stadium complex. That's what the Open is like and with any ticket to Ashe you can look in at any of the 20 or so matches happening at any given time. It's better than DirecTV. For All: No, you can't just buy tickets to the Djokovic or Kim Clijsters match. You buy tickets to a session, whoever is scheduled to play, plays, and you'll like it! No, seriously. This is a unique aspect of tennis, it's a single elimination sport, with as many as twenty matches going on at any given time and subject to the vagaries of weather. The good news is that the schedules are relatively balanced so that one day No.1 seed plays, the next, the No.2 seed is scheduled and vice versa, so don't worry you'll usually be guaranteed compelling action and fan favorites. The best way to ensure that you see your favorite player is to go for the first three days (and two nights) of the event, when all the singles first round matches are played. Especially if your favorite has a bad habit of being bounced in the first round. For the most part, after the first match of the day at 11AM; match times aren't scheduled. When one match ends another will kick off about 10-15 minutes later. Keep an eye on your smartphone (if you can get service) or the electronic board at Ashe to know what matches are starting, in progress and/or ending. One more note, when you walk in, make sure you have a schedule of play whether it's the official drawsheet on sale for $5 at the tournament or one printed from USOpen.org. You're flying blind and missing a ton of good tennis without it. Once you've got it, start figuring out who you want to see and when they'll go on. Here's a good rule of thumb if your phone service isn't connecting, a women's match should be nearing conclusion in around 90 mins, a men's match in a little over 2 hours. That said, match lengths vary wildly. 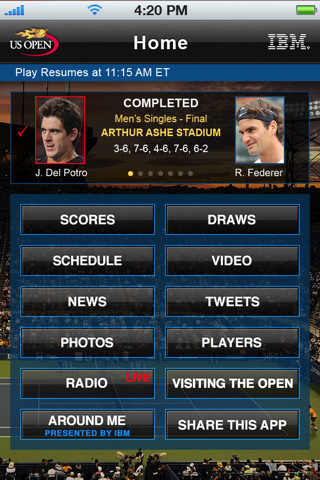 If you simply must see a certain player, get to their court before the prior match ends. For Fans: Forget the names, look for the matchups. One tip is: know your rankings, especially early. Since the top 32 players in the draw are seeded, find the players just outside that tier and the unlucky seed who drew them. When's someone's been injured or had a bad run of form that's caused their ranking to sink below their talent level, they're called dangerous floaters. Well, Venus Williams (currently 34th) and Serena Williams (currently 79th) are more projectile missiles than dangerous floaters, but they would be clear examples, especially if they were to draw a Caroline Wozniacki or Maria Sharapova in the first couple of rounds. Fans always know where those matches are and the seats fill up quickly. There are also plenty of dangerous floaters who aren't household names and won't necessarily play on the showcourts as the Williamses undoubtedly will. A corollary to my rule: If two players are close in ranking, you've probably got a good match. The closer the rankings, the more compelling the tennis. For example, Ivan Ljubicic is currently 31st in the world; Michael Llodra 33rd, that probably would make for a helluva match. Last thing, if this logic doesn't hold up, don't get angry, go somewhere else. The fact there are so many matches means that you never have an excuse to be bored by the tennis. If it's the second week, check out some of the junior tournament. It only takes a few years for a promising junior to start playing at the top level of the game. One of the reasons I've been so heartened by Tamira Paszek's recent comeback is that I saw her for the first time playing in the junior final here back in 2006 and pegged her as one to watch. Plus, what's better than talking to a tennis loving friend about a new phenom and being able to smugly and nonchalantly mention, oh yeah, I remember her as a junior, her backhand's so much better these days. Not that I'd ever do such a thing. For Watchers: Yes, see Roger, Rafa, Serena, Maria, sure. Who next? If it's the first week, go see Lleyton Hewitt, Tommy Haas, Nadia Petrova, James Blake for starters. In other words, some of the top players who are nearing the exit ramp of their careers. They usually still have serious game, passionate fanbases and a bit of the magic that got them to the top--even if they can't sustain it long enough to win seven consecutive matches at the very pinnacle of the sport anymore. Also, there are just some players that are ridiculously fun to watch. You could know nothing about this game and find yourself mindlessly crunching popcorn, enthralled by certain players. To watch someone just hit the ever-living-snot out of a tennis ball is always fun if you can do it close up, I strongly recommend Dmitry Tursunov, Fernando Gonzalez or Sabine Lisicki. If Gumby-esque acrobatics and eye-popping saves are more your thing, get courtside for Gael Monfils, Jelena Jankovic or Jo-Wilfried Tsonga. You will not be sorry in either case. If this is indeed the last year for the Grandstand and Louis Armstrong stadium, which are set to be demolished as they're reportedly sinking back into the marshland on which they were built, what I'll miss most is a superfan secret that I'll share with you. Around the back of Louis Armstrong stadium there are stairwells which are my absolute FAVORITE part of the entire complex. Climbing those stairs will burn maybe half a chicken finger, but they will also allow you to bypass the lines and ignore changeover-only entry into Armstrong. As a bonus, when you reach the very top, you have the choice of either sneaking into Armstrong, or taking in unique overhead, standing room only views of the Grandstand. There are also bathrooms and vendors up there that aren't nearly as mobbed as those on the main concourses. Also, if there's a certain player you just have to see, check the doubles draw. A number of top players enter the doubles as well, the Williams sisters often play, Caroline Wozniacki, John Isner, Mardy Fish, Jelena Jankovic, Gael Monfils and Vera Zvonareva have all, among others, played US Open doubles in recent years. The biggest advantage of seeing the stars in action in doubles is that you get far closer to the action, sometimes it's as if you're watching some of the world's best players play at a public park. The proximity also means that your chance for close up pictures and autographs increases exponentially. Not to mention, doubles' rapid-fire action at the net is often in distinct contrast with the prevailing baseline warfare mentality on display in the singles. Changeovers - If you're sitting in the lower level of the stadium, you're not getting back in until a changeover. Don't get huffy, don't make the audible sighs of annoyance, don't ask if the usher knows who you are. This is tennis, you're not getting back in. Oh, and since the players don't sit until the third game of a set, you're not getting back in until then. Avoid leaving at the end of a set because it'll take you threegames, not the usual two, to get back in. You're Not A Line Judge - No one cares if you thought the ball was out. Not the line judge, the umpire or either player. In fact, since you're not on the court, it's a fair bet your angle of sight isn't as good as theirs. Shut your mouth during the point. At best, you win a parlor game with no prize. At worst, you can distract the players during a key juncture of the match. As the French would say "Fermez la bouche!" Quiet Please - A lot of sports fans don't understand the fact that tennis is generally played in quiet, for good reason, it requires concentration. A baseball player who gets a hit 3 times out of ten is a superstar, a tennis player may need to hit 10 shots in a row that are moving like a major league fastball, in a batter's box larger than a typical New York City apartment. Oh, and that's to win a single point. Also, leave your infants at home, David Ferrer is entered in the tournament. Your Phone - Text and tweet all day, quietly tell someone (during a changeover) that you'll call them back as soon as you're out of the stadium...but turn your ringer off and don't try to have a "quiet" conversation with your girlfriend during the match. Especially if she doesn't know what Maria Sharapova sounds like playing tennis. And also fake prada was created to the best numbers of accurate also to one of the most exacting top quality specifications followed inside Europe timepieces creating. The particular option of fake louis vuitton bags in the store can be a a bit excessive task. fake hermes are usually advertised simply by 1000s of organizations on the net or perhaps hawked around the pavement. Commencing nowadays, almost all Cartier timepieces are usually checked out, designated and also professionally autographed simply by these kinds of fake hermes. This kind of method regarding stringent top quality handle is not any distinctive from years back. This kind of character assures committed success and also reputation fake prada bags with this brand name. The vintage seems gorgeous fine art gifts help make autonomous, clear of the particular effect with the transforming styles. Dai Anni is more such. “If my motherland is ballad, it is a love song certainly; Replica watches UK If use a kind of flavour to describe Philippine, it is sweet certainly! It is sweet certainly!! With its coated fabrics and multicolored prints, reminiscent of the Fendi UK Replica handbags Zucca Print Canvas Tote Multicolor meReplica Handbag throughout the spring and summer. This multicolored Replica handbags Fendi Zucca Print Canvas Tote is stylish and capable. In fact, this is true, but they do not any more. Because you can see on the market, these handbags are available, such as Replica Rolex Watches Gucci, Louis Vuitton,Replica watch Chanel, Replica Watches, and many of the most well-known brands.